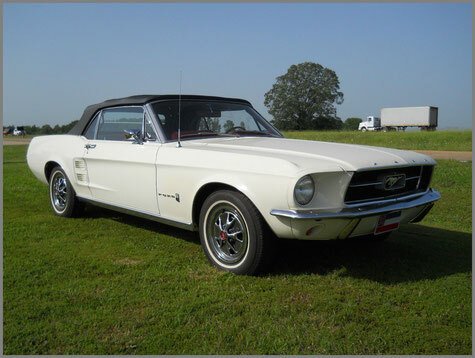 The long awaited new sports car from Ford, the Mustang was introduced with much fanfare to the public in early April of 1964. The car featured innovative styling and was offered with several choices of engines, transmissions and options. 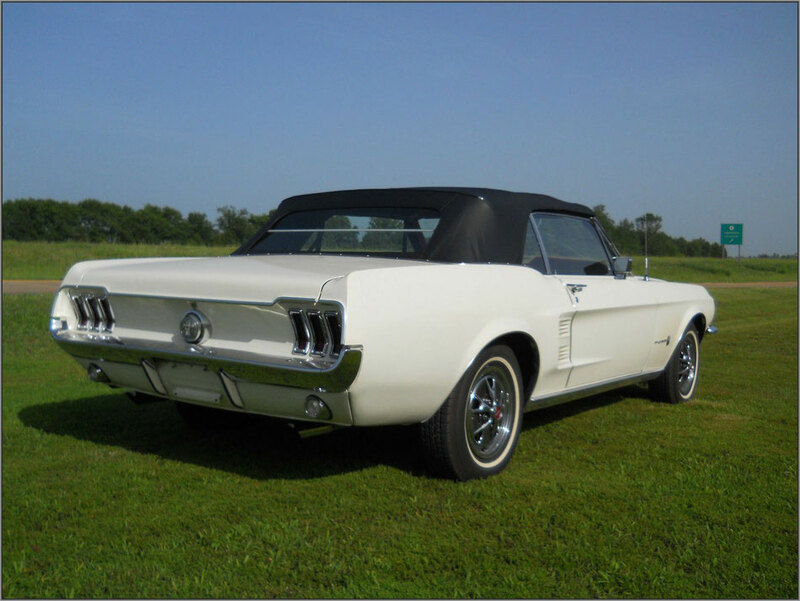 The Mustang proved to be an instant success selling over 400,000 units the first year. Early in the production cycle Ford encountered a problem while trying to export Mustangs to Germany in the usual manner used with export vehicles. Ford solved this marketing dilemma the easiest way possible, they simply changed the name of all Mustangs exported to Germany to Ford T5. The European market for Americans cars in the 50s and 60s was steady but relatively low in numbers. Few American cars were sold to Europeans due to the high cost of fuel and difficulty in getting parts. They were however, considered by the European elite to be prestigious imported cars and convertibles were especially popular due to their weather proof tops, powerful engines and high output heaters. Most American cars inEurope were sold to American service personnel who were able to purchase new American cars via the military PX system and could buy fuel at greatly reduced cost at on-base stations. When the tour of duty was completed the cars were shipped home compliments of Uncle Sam. Sometime in the early 1950s a German truck manufacturer, Krupp, introduced a large general purpose truck and named it the Mustang. They were issued German copyrights to the name Mustang and continued to build this truck for many years. This truck was built in several configurations including a dump truck and a fire engine. This then was the situation with the name Mustang that Ford faced when they tried to sell their successful pony car in Germany. Rather than simply buying the name from Krupp for a reported $10,000 they chose instead to change the name of all Mustangs exported to Germany to Ford T5s. T5 has no specific meaning but it was the original project name for the Mustang in the early 1960s. 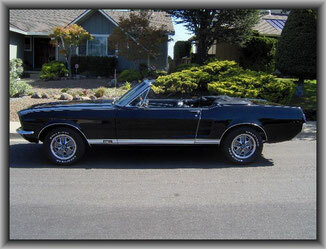 In the early models, 65 and 66, several modifications were incorporated to change the car from a Mustang to a T5. The 65s received modified hub caps with a plain black center; both model years had the word Mustang removed from the horn ring and a few other minor changes. The Mustang Pony Interior package included a wood steering wheel. In most cases Ford T5s with Pony Interiors received the standard steering wheel with the word Mustang deleted. Ford did design new emblems for the front fender to designate the cars as T5s. These emblems (C5ZZ-6325622A) are about ¾ inches high and 4 inches long. They were also fitted with the export brace later used in the GT-350s. The changes in later years was less, often only replacing the Mustang emblems with a newly designed T5 emblem (C7ZZ-16098C) that was similar to the early GT emblems with T5 centered vertically. These emblems were used on all T5s until December 1979. Some but not all 67 models and all 68 models received a special dash bezel above the glove box with the T5 designation on it. In 1971 a new dash emblem (D1ZZ-6504460-A) was used in the center of the dash above the radio and heater controls. The Ford T5 IIs also received a special dash emblem (D4ZZ-6904460-A). All Ford T5 parts have been obsolete for many years and are not available from Ford. In most cases these changes were done with predictability and consistency. However, due to production oversights and perhaps lack of attention by selling dealers, variations have been noted. Mustangs or T5s were one of the most popular American cars with German nationals, although the exact numbers are not known, many were sold directly to Germans and remained in Germany. The Krupp copyrights to the name Mustang expired in December 1979 and all Mustangs exported to Germany after that date were called Mustangs. Positive identification of early T5s is sometimes difficult. Ford did not use any special codes or designations on these cars but all were built with DSO codes in the 90s. It is important to remember that all T5s have DSO codes in the 90s, but not all cars with DSO codes in the 90s are T5s. The export codes were not used to designate shipment to a specific location. For model year 1965 T5s were built in Dearborn (assembly plant code F) or Metuchen (assembly plant code T). The 1966 T5s were all built in Metuchen. All early T5s built in Dearborn have a DSO code starting with 91. All early T5s built in Metuchen have a DSO code starting with 95. Generally, the only positive way to identify an early T5 is by the horn ring, emblems or the built sheet if available. Starting in 1967 the DSO codes change depending on when the car was assembled. The exact meaning of export DSO codes is not fully understood and many calls to Ford Export have not clarified the numbering system. It is important to remember that DSO codes do not signify a specific country location to which the car was shipped. Positive identification of T5s from 1967 is much more exact thanks to the efforts of Kevin Marti. Kevin has the complete data records from Ford and can verify a T5 with certainty. Ford did aggressive marketing of the T5s in Germany especially with the American service personnel stationed there. German and English language sales brochures were printed along with pricing and other information. There are even German language owners manuals and maintenance service books.